You are here: Home / DIY Projects / Before & After / Industrial Family Room – REVEAL! 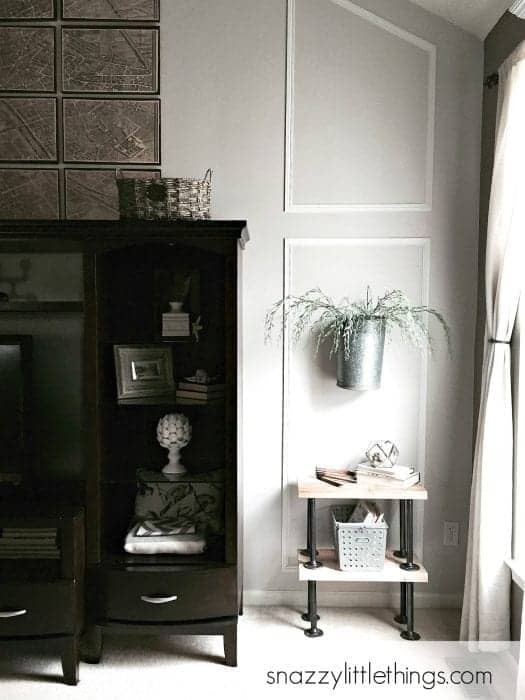 For this challenge, Mark and I chose to update the most abused room in our house – our family room. 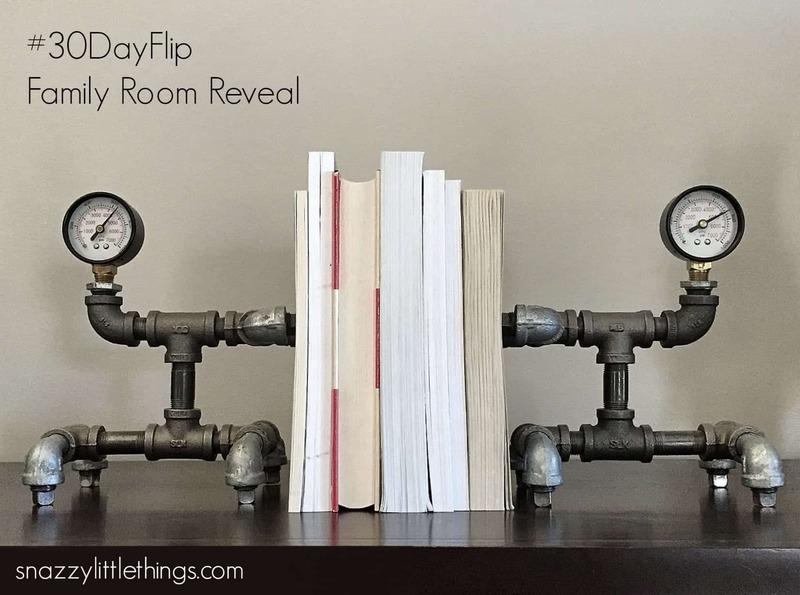 Visit this link to see all of the projects that led to this final reveal, then be sure visit all the participants’ April #30DayFlip room reveals at the bottom of this page! Here it is, AFTER–with only 15 days of work invested. One of the biggest issues was my failure to find properly sized art on our huge wall. I could never find anything sized (or priced) just right – so I made my own! 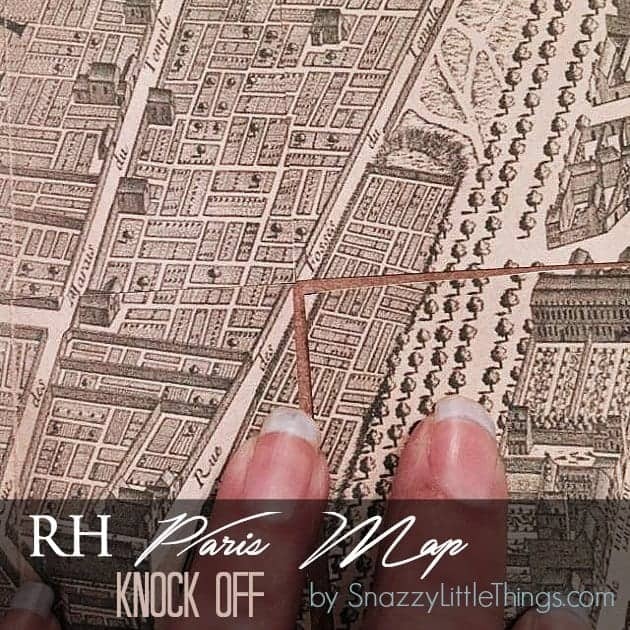 You can read more about my HUGE (72″ x 56″) Restoration Hardware knock-off Paris art here. (Theirs = $1,700 Mine = $40). We still have a few projects remaining…(my trip to Israel set me back a bit, so ours was really a 15-day flip!) But we are already so much happier with this space and the progress we’ve made. I will update this post as we add a few finishing touches. Galvanized antique sap buckets mounted as wall planters. I tried my hand at a little Fixer Upper-inspired decor. 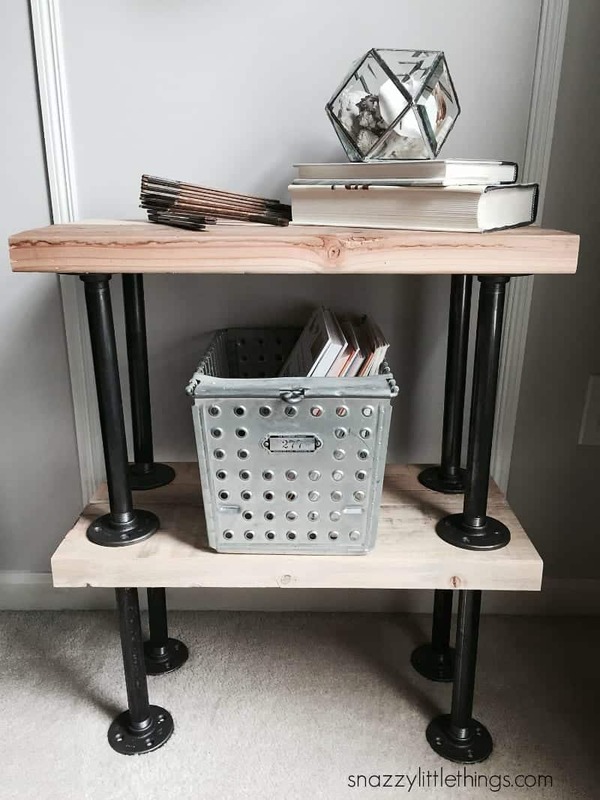 Our DIY industrial tables aren’t quite finished. We’re letting them settle into the space before we decide on the final finish. Read my original post and where I purchased them here. I will add a few more pictures once we put our finishing touches in the room. For now, we feel like the room is lighter and airier. For us, this was a major accomplishment–and it wasn’t very easy. We spent a lot of time going up / down ladders, running to the garage for extra cuts for our wall trim. But without the #30DayFlip I don’t think we would have been quite as motivated. I’m so happy to have hosted my very first DIY challenge where readers participated! I get to know all of them on a completely different level, plus, it’s always more fun to DIY and share progress with a group with similar interests standing by to cheer you on. I’m amazed by the results (see all of the before & after pictures at the bottom of this page). I’m so proud of our group, and thank you again for our generous sponsors, Ryobi Power Tools, Steam Showers, Inc., Poppie’s Paint Powder, and Arts and Classy. See all of our WINNERS of the prize package, just for participating! Next month’s challenge: outdoor spaces. Sign up for the next #30DayFlip by clicking the button below. I adore the art onyour feature wall, dear one!!! in our lower level Family Room!!! Thanks for the creative “feature wall”!!! Your living room looks great I love the industrial feel of the room. The DIY Paris Art work sure did bring that wall to life. Thanks so much Trish! We are so happy with the outcome…and so glad it’s over! Your room makeover is gorgeous! I love what you did with the walls. It is so hard to come up with something for such large wall space and your solution is brilliant! Gorgeous! Love the map art and those industrial bookends are fabulous! Great job! Hi Jeanette, how are you sweet friend? 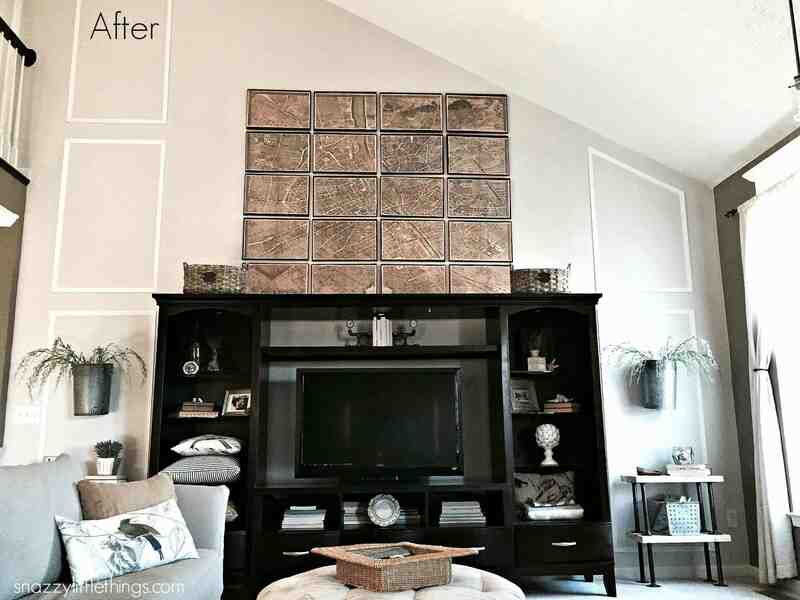 I LOVE your Family Room makeover and the Restoration Hardware Inspired artwork is fabulous!! Thank you so much for linking up to our Something to Talk About Link Party this week. This was such a hit, it was one of our “MOST CLICKED” and You are being featuring at our link party tomorrow morning at 6 am est. Love for you to come on over and join us again, Happy Memorial Day and enjoy, Lisa at Concord Cottage. 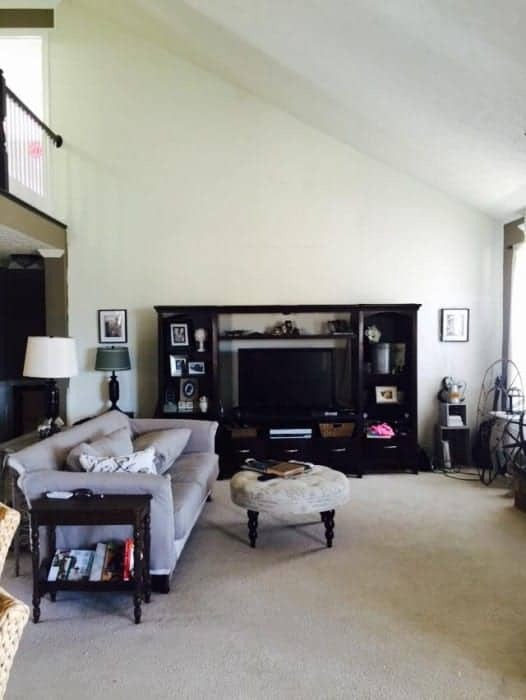 Wow, the after looks like a totally different room. I love your taste of decor and your huge DIY decor above the mantle. Thanks for sharing with us at the Home Matters #homematters linky party. We love having you and hope you join us again. Thanks Zan! I was thinking our color choices would make the room a little bland, but it feels so much brighter with just a little paint. Putting large art on the wall validates that space…it makes you notice the ceiling height more. Thanks so much for stopping by! Wow! I cannot believe the map art you made! That is amazing! And saving over $1600 is definitely the way to go!